Raumfahrt+Astronomie-Blog von CENAP - Blog: Astronomie - GENESIS Projekt: Sollten wir Geschenk dem Kosmos mit Leben geben? Some exoplanets are only considered habitable for short periods of time, should we give life on these worlds an evolutionary helping hand? The search for what we would deem to be "habitable" worlds orbiting other stars has reached a crossroads in recent years. As our technology and techniques improve, we've been able to identify small rocky worlds orbiting within other stars' "habitable zones." So far, we can measure an exoplanet's mass, understand its physical size, even calculate its average density, revealing whether or not that planet may contain quantities of water, for example. Add these factors to our knowledge of that alien world's orbit and we are given tantalizing clues as to whether liquid water may persist on its surface. These apparently habitable worlds are quickly labeled "Earth-like," but they may not be like Earth at all. There's a lot more to our planet besides its mass and orbit that makes it habitable -- namely our thick atmosphere and protective magnetosphere, both of which safeguarded burgeoning terrestrial life around four billion years ago from the ravages of space weather. Lacking sufficiently powerful observatories, we're not able to detect atmospheres, let alone magnetospheres, around distant small exoplanets, so the "Earth-like" moniker is premature at best. But as we continue to discover all the weird, wonderful and extremely varied exoplanets our galaxy has on offer, we're finding the potential for worlds that may be considered "habitable" for short periods, hypothetically allowing life (as we know it) to be sparked, only for the habitable conditions in these worlds' atmospheres to dramatically change, snuffing out the immature lifeforms. An often-overlooked factor in the science behind the evolution of life is time, and many of the exoplanets we've found may well be habitable during short periods of their existence, but not long enough to allow life to gain a foothold. In an interesting discussion published in the journal Astrophysics and Space Science, Claudius Gros from the Institute of Theoretical Physics at Goethe University Frankfurt investigates the possibility of giving life a helping hand by blasting it into interstellar space and flinging our ready-made biology toward exoplanets that may only have a very short window of habitability. "It is therefore certain that we will discover a large number of exoplanets which are inhabitable intermittently but not permanently," Gros said in a statement. "Life would indeed be possible on these planets, but it would not have the time to grow and develop independently." When basic life took hold on Earth, its very existence helped to shape the habitability of our atmosphere. For example, bacterial mats changed the chemistry of atmospheric gases, boosting its oxygen content and facilitating the evolution of complex eukaryotic cells, upon which all multicellular life is based. In Gros' discussion, he imagines sending a small interstellar probe to another star system. On arrival, that probe would somehow slow down and, using an on-board biological laboratory, would synthesize a selection of single-celled organisms that would then be dropped onto a habitable, yet lifeless world. Should this biological "Ark" of sorts seed the first microbial life, potentially billions of years of evolution would have been skipped on that world allowing life to take hold within the tight window of opportunity, possibly allowing it to spawn a self-sustaining alien ecosystem with a very terrestrial flavor. "In this way, we could jump the approximately four billion years which had been necessary on Earth to reach the Precambrian stage of development out of which the animal world developed about 500 million years ago," he added. This highly speculative method of seeding life is called, perhaps unsurprisingly, the "Genesis Project" and Gros sees it as a means for us to "give life something back." 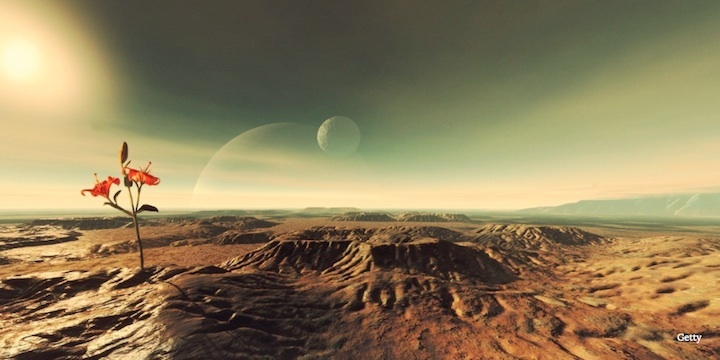 Seeding life on other worlds is not a new concept; science fiction has tackled it countless times and there are some scientific foundations for the idea. The mechanism known as "panspermia" is a hypothesis that governs the transfer of life from one planet to another. Should a massive asteroid hit one planet brimming with life, sending a chunk of rock packed with living microbes into space, that rock may land on another planet with some habitable qualities, allowing a few of the surviving microbes that hitched a ride on the rock to make a new home. But the mechanism described by Gros is a variation on the "directed panspermia" hypothesis where an intelligent civilization wants to seed life on other worlds in their image, sending biological capsules to spark their brand of life elsewhere. However, we quickly fall into an ethical trap. Just because we have life on Earth, is it our biological obligation to share it with the rest of the galaxy? Or would such an act be no better than biological pollution or, even worse, a biological weapon? Just because we've got it, doesn't mean the rest of the universe wants it. One obvious problem is the question of native lifeforms; say if a target world already has a rapidly evolving lifeform that's taken the opportunity to gain a foothold on that world? A Genesis Project capsule dropping on their heads filled with an out-of-the-box Earth BrandTM goo would be disastrous. Though Gros points out that great pains should be taken to ensure the target planet isn't already inhabited, when talking about the potential genocide of the foundational biology of a future alien race, it would be hard to justify such a risky mission. FRANKFURT.Can life be brought to celestial bodies outside our solar system which are not permanently inhabitable? This is the question with which Professor Dr. Claudius Gros from the Institute of Theoretical Physics at Goethe University Frankfurt is dealing in an essay which will shortly appear in the scientific journal Astrophysics and Space Science. Over the last years, the search for exoplanets has shown that very different types exist. “It is therefore certain that we will discover a large number of exoplanets which are inhabitable intermittently but not permanently. Life would indeed be possible on these planets, but it would not have the time to grow and develop independently”, says Gros. Against this background, he has investigated whether it would be possible to bring life to planets with transient habitability. From a technical standpoint, the Genesis mission could already be achieved within a few decades with the aid of interstellar unmanned micro spacecraft which could be both accelerated and slowed down passively. On arrival, an automated gene laboratory on board the probe would synthesize a selection of single-cell organisms with the aim of establishing an ecosphere of unicellular organisms on the target planet. This could subsequently develop autonomously and possibly also into complex life forms. “In this way, we could jump the approximately four billion years which had been necessary on Earth to reach the Precambrian stage of development out of which the animal world developed about 500 million years ago”, explains Gros. In order not to endanger any life which might already be present, Genesis probes would only head for uninhabited exoplanets. The mission’s actual duration played no role in the Genesis project, since the time scales for the subsequent geo-evolutionary development of the target planet lies in the range between a few tens of millions and a hundred million years. The Genesis project therefore has no direct benefit for people on Earth. “It would, however, enable us to give life something back”, says Gros. In this context, he is also discussing whether biological incompatibilities would have to be expected in the case that a second Earth fully developed in terms of evolution were to be colonized. “That seems, however, at present to be highly unlikely”, says the physicist, dampening any too high expectations. Information: Prof. Claudius Gros, Institut für Theoretische Physik, Campus Riedberg, Tel. : (069)-798 47818, gros07@itp.uni-frankfurt.de.